Unless you’ve been living in a self-induced media blackout, you’re probably aware that thousands of athletes from around the world have been in Rio for the past few weeks competing in the Summer Olympics. Even if you haven’t been watching the action, no doubt you’ve seen coverage on social media. During this year’s opening ceremony, the hashtag #rio2016 generated 109 million mentions on Facebook and 51 million Instagram interactions. And while casual fans are welcome to tweet and post using that hashtag and other Olympic-centric phrases and words, it’s a different case for brands that aren’t official Olympic sponsors. The U.S. Olympic Committee has strict brand regulations in place (backed by U.S. trademark law) that specify how Olympic language and logos can be used. Non-sponsoring brands can’t refer to the Olympics by name, make any mention of Team USA, or even drop a hint of “going for the gold” without risking legal trouble. Even a tweet congratulating an athlete on a win is dangerous territory. You can thank Nike for these severe rules. During the 1996 Summer Olympics in Atlanta, the footwear brand gave sprinter Michael Johnson a pair of golden running spikes to wear. When Johnson won, he and his Nike shoes made the cover of Time. Nike also distributed flags with their famous swoosh logo and opened a “Nike Centre” outside the athletes’ village. Reebok, which had paid millions to be an official sponsor, was furious over their competitor’s guerilla marketing tactics, as were Olympic officials. 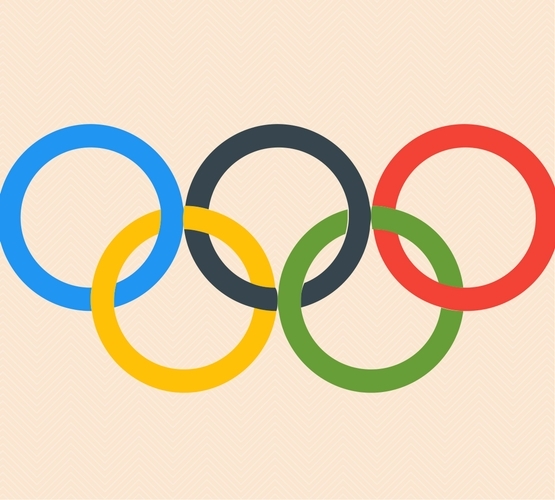 Brand usage of Olympic trademarks was tightened, and over the years has grown to include regulations for social media, educational and editorial content, and entertainment industry use. This year, several brands have stretched their creative muscles and developed ways to acknowledge the games while still adhering to official guidelines. Automaker Ford went the patriotic route to promote their 2017 Escape SUV via Snapchat. For 24 hours, a Snapchat lens allowed users in the U.S. to paint their faces red, white, and blue. Athletic apparel company Oiselle slipped around the ban on hashtags that include Olympic trademarks by making their own–#TheBigEvent–to refer to the games on social media. And General Mills paid homage to the Trix rabbit and the Olympics with their Rabbit Showdown video. It features rabbits participating in events like diving and gymnastics and encourages viewers to submit videos of their own rabbits in action. The Olympic Games have become as much about marketing as they have about the actual athletic competition. Capitalizing on a major event like this allows brands to connect with audiences and remain relevant. It can be tough though, especially when there are obstacles in the way. However, with the right strategy, brands can utilize current happenings to significantly raise awareness and increase their business.